In May 1917, a solitary, small two-seat reconnaissance plane took off from a forward airstrip near present-day Basra. The rear-seat observer was Lieutenant-Colonel George Adam Beazeley. His aircraft was assigned to the Royal Flying Corps No. 63 Squadron. Originally deployed in Western France in 1917, the Corps rerouted No. 63 Squadron to Mesopotamia later that year. Military planners decided that No. 63's state-of-the-art photographic and surveying instruments could be put to better use in finding, identifying, and mapping German and Turkish positions in the desert. This would suit Beazeley quite well: a graduate of the Royal Military Academy at Woolwich and member of the Royal Engineers, he was a capable officer well versed in the latest tools and methods of ground surveying. 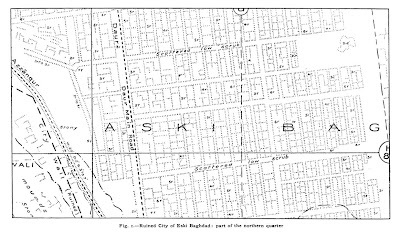 Beazeley was one of a small group of officers entrusted with the task of producing survey maps of the banks of the Tigris River north of Baghdad. 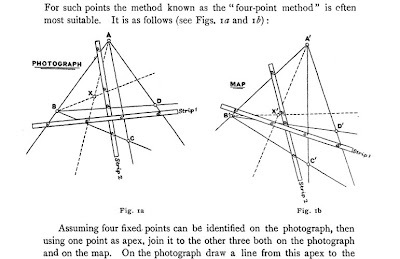 In an article for a 1919 issue of The Geographical Journal, Beazeley described how Colonel Gunter of the Royal Engineers and head of the Royal Flying Corps’ General Mapping Headquarters created an aerial survey methodology for No. 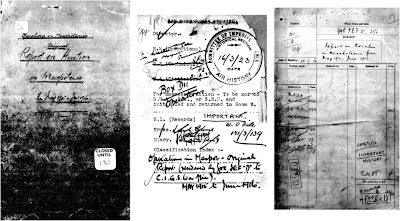 63 Squadron: “first to photograph the whole area from the air; then to reproduce 6-inch scale blue prints, transfer them to the plane-table; and carry out supplementary ground survey.” Aerial photography, a technique that was still in its infancy even during the latter moments of the First World War, was deemed more important than the more time-honored techniques of ground surveying. Beazeley did not lose sight of the fact that aerial photography provided a quick means of abstraction and representation that could eclipse the slow process of obtaining geodetic data. Moreover, aerial photography became a medium for discovery — it could reveal things otherwise unseen from the ground. For his 1919 article, Beazeley described the fruits of his aerial survey of the Tigris River, which ended in September 1917. He noted how Gunter’s method “was carried out, with the result that the remains of an ancient city were disclosed which would not otherwise have been discovered, in all probability. It was some 20 miles long and anything up to 2 ½ miles in width, and must have supported a population of about four millions.” Here, Beazeley is referring to Samarra, the former capital of the Islamic world during the 9th century. Beazeley’s claim that he discovered Samarra is complicated. German archaeologists Ernst Emil Herzfeld and Friedrich Sarre began their first excavations at Samarra between 1911 and 1913. 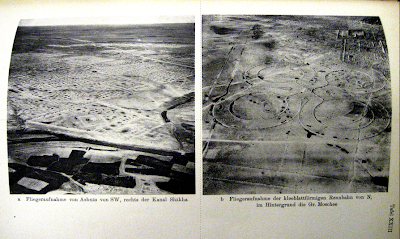 The results of these excavations would figure prominently in later work such as Sarre’s Archaeologische Reise im Euphrat und Tigris-Gebeit (1911-1920) and more famously, Herzfeld’s multi-volume Die Ausgrabungen von Samarra, whose fourth installment, Geschichte der Stadt Samarra (1948), would feature Beazeley’s aerial photographs. Beazeley’s photographs are known to be some of the first-ever aerial views of an archaeological site, and are significant as historical documents as much as they are documents about history. And yet, we know about Beazeley's photographs primarily because of Herzfeld's text. 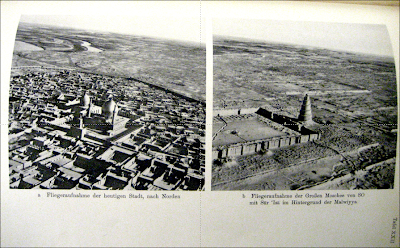 Beazeley and Herzfeld used the same photographs of Samarra to suggest differing claims about the utility of the aerial view in archaeology. Beazeley was understandably excited about the future potential of his discovery and wrote about subsequent discoveries made from the air. For example, in 1919 he noted how “Surveys of areas for archaeological research can in the future be greatly assisted by air photography.” For Herzfeld, however, the photographs were only ancillary: photographic embellishments to an exhaustive catalog of finds in Samarra. That these photographs enjoy an afterlife of sorts in the pages of Geschichte der Stadt Samarra is important because Beazley was unable to complete his task of interpreting his views of the Abbasid city. This is perhaps one reason why Beazeley’s own remarks about his aerial photographs of Samarra seem naïve or misinformed. 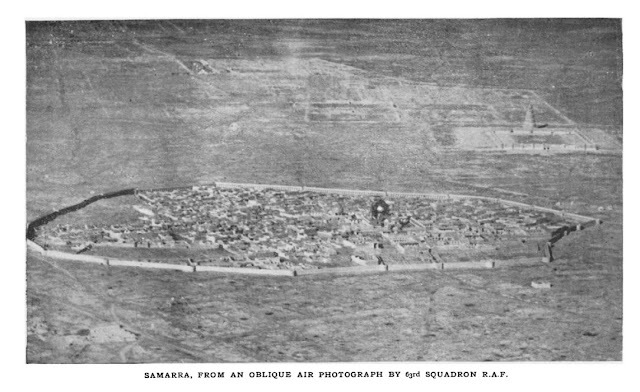 Though he described Samarra’s streets and buildings “in plan very much like an American city”, Beazeley confessed that “[u]nfortunately I was shot down and captured before being able to make a detailed survey … during a lull in the military operations.” Interned in a prisoner of war camp near Kut, and without his photographs, Beazeley relied on his own memory to create a series of sketched and contour drawings of Samarra. The recovery of such plans is one of the main objects of archaeology; excavation has hitherto been the principal method employed; but it will, I think, be evident that air photography is often a quicker, cheaper, and more effective method of achieving the same object. The most conspicuous example up to the present is the Samarra district. The modern town of Samarra lies 65 miles north-north-east of Baghdad, on the left bank of the Tigris. It is now the only habitation there, the shrunken relic of a vast continuous mass of buildings 20 miles in length. The ruins were visited between 1830 and 1850 by Ross, Rich, and Felix Jones, who published useful accounts and plans. They were again visited and described by Herzfeld, Viollet, and Miss Bell early in the present century. Herzfeld's monograph (Berlin, 1907) is the standard work, upon which my remarks are based. Colonel Beazeley published two short papers in the Geographical Journal (May 19I9 and February 1920), illustrated by excerpts from war maps which had been compiled from air photographs. But he reproduced only one vertical air photograph, and it cannot be regarded as a success. And in 1954, when mentioning the same photographs, Crawford noted how Beazeley “discovered the most amazing things when flying over the Tigris valley 60 miles north of Baghdad.” As in 1929, Crawford commended Beazeley for being able to take his pictures before he was captured. If sites like Samarra are “evanescent, and will not wait for the slow mobilization of official channels”, then it follows that the aerial photograph offers a way to record historical traces before they are buried by the literal and figurative sands of time. The new subject of archaeological air photography was born in the Middle East during the War, and the first expositions were published in the Geographical Journal in 1919 and 1920. Colonel Beazeley’s pioneer work in that region, however, was not followed up. A few air photographs of ancient sites were taken and used to embellish books and articles; but they revealed little that was not already known. That was mainly because they were of the oldest sites in Mesopotamia, which, for the most part, are too deeply buried to reveal their plan. But it was already evident that there did exist a multitude of suitable sites both in Mesopotamia and in Trans-Jordan; and it was decided therefore to approach the Air Ministry, in the hope of enlisting their help. The result was very gratifying. An undertaking was given that, subject to certain obvious limitations, ancient sites might be included in the normal routine of practice photography. Further, it was agreed that these, and also many existing but obsolete negatives of sites abroad, should be handed over to the Director of the British Museum, to form the nucleus of a national collection. The aerial photographs of Samarra, as well as of other sites like Basra and Nineveh were properly archived. 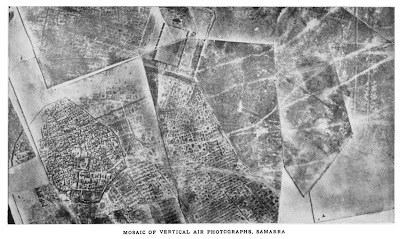 And although the quality and utility of these photographs improved as the photographic technology improved, the aerial photographs of Samarra continue to present problems. Beazeley’s photographs, for all their innovation, remain cryptic and of limited use when used along the text of Geschicte der Stadt Samarra. These photographs are also of limited value: not only are they low-resolution -- Beazeley failed to properly read them. For all the inaccuracies involved in the taking of these aerial photographs, we must be somewhat forgiving towards Beazeley, who wasn’t exactly a student of history. Aerial photography, when used to verify terrestrial information, was a process fraught with difficulties. This is primarily because as Beazeley exposed the photographic plates, the camera was shaking and swaying due to the aircraft’s own movements. 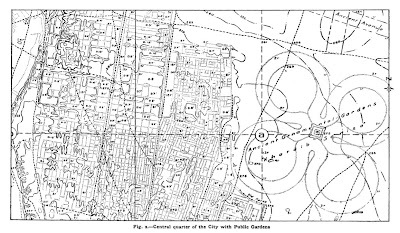 Using devices like the projectograph (above), he would have had to ensure that the geodetic control points on a survey map fit precisely with an aerial photograph for either to be of any use. This level of precision required a pilot to fly an airplane at a level altitude with no degree of pitch. 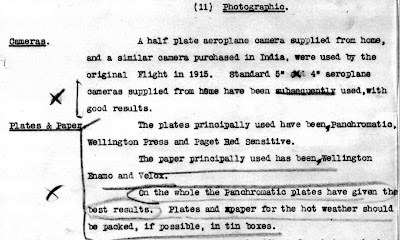 In addition, the Royal Flying Corps’ photographic manual and guidelines required all aerial photos to be taken from an altitude of 6,000 feet or higher. This not only ensured that a reconnaissance aircraft was immune from ground fire, but also minimized the aircraft’s exposure to lateral wind shear. The airplane, merely as a means of conveyance, is by far the best invention of man, for it is swift, safe, and comfortable. As an instrument of archaeological research it is (with a camera) second only to excavation, and sometimes even more effective. The photographs … a selection only from 1700, the nucleus, I hope, of a great national collection – will inaugurate a new epoch in oriental studies. The future of exploration, and not only of archaeological exploration, is literally in the air. G.A. 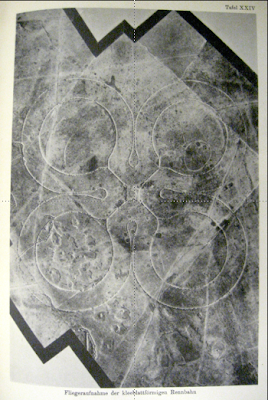 Beazeley, “Air-photography in Archæology”, The Geographical Journal, Vol. 53, No. 5 (May, 1919), p. 330. O.G.S. Crawford, “Air Photographs of the Middle East”, The Geographical Journal, Vol. 73, No. 6 (Jun., 1929), p. 498. Crawford, “A Century of Air-Photography”, Antiquity, Vol. 28, No. 112 (Dec., 1954), p. 209. Crawford, “Air Photographs of the Middle East,” p. 497. 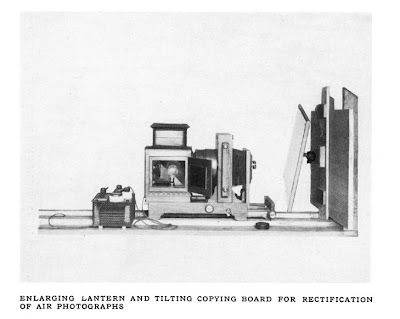 Beazeley, “Air-photography in Archæology”, p. 330. Report on Aviation and Flying Operations in Mesopotamia, 1915-1916 (May 1915) (Air Ministry Archives, AIR 1/504/16/3/23). Crawford, “Air Photographs of the Middle East”, p. 498.
enrique, i'm coming back to read this more slowly but it's very timely for me- i've spent the summer looking for islamic architecture from google earth. this means a lot of close-up time with iranian nuclear plants [exquisite resolution] and lost cities in the middle of large deserts [blurry eyes for me]. all in all not a bad way to make ends meet. Few would argue with your conclusion that "it is impossible to play the Corbusian fantasy and pretend that anyone can learn anything about cities (or for that matter, Islamic cities) from this process." At the same time, there is a certain kind of information that one gains from obtaining unusual perspectives, regardless of the distortions, as it brings our attention to aspects of a space/city/bldg that we might have glossed over. Certain aspects of the terrain - built/natural- reveal themselves in way that might otherwise be missed because of the perspectival distortions. In other words, the imprecision of the process is exactly what makes it interesting. Its the artistry of them as non-objective records which provokes the viewer to look at them with fresh eyes. They demand to be looked at differently, through aesthetic lenses. Of course, I'm biased. I love these photos for a slew of aesthetic reasons so maybe I'm reaching. But only a little. Thanks again for sharing the article. Great work. Very fascinating post, Ana María ... When I was researching the history of these aerial photographs, my professor at the time (Thomas Leisten) remarked how a lot of archaeology depended on Flickr and Google Earth these days. So I wonder if your post is more timely than mine! thanks enrique! what i really like about looking at these sites from google earth is that you can often see the scars in the land- something that might be harder to see up close. i'm often looking for things that have been demolished, but the scars usually remain unless something is built on top. similar i guess to how the nazca lines have to be seen from above. Another good post- I've become a regular reader, I only wish you would post more often. i also enjoyed your post on the moon. And though I have not seen "In The Shadow of the Moon", I do look forward to seeing it when I get the chance. About my infrequent posting: I too wish that I could post with more frequency. Thing is, I'm in the middle of studying for my PhD exams, and I have less time than ever to create posts for a456. However, I will have something up by tomorrow or Saturday. Stay tuned!